The Hydra. Not a monster you wanted to mess with. That is, until one herculean traveler in search of a good jostle happened upon it and had the fortitude to neutralize the legendary creature. Well, Heracles did work on the Hydra back then, and if you are of the same makeup as he, REV’IT! has made it possible for you to master the Hydra as well. The REV’IT! Hydra H2O Gloves are a rugged mix of waterproof dependability, motorcycle protection, and cold-weather warmth. 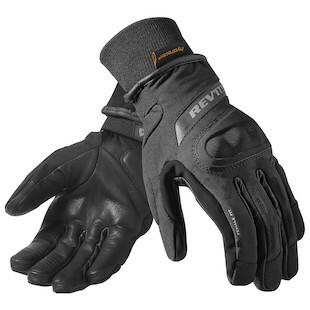 They are the kind of gloves that charge headlong into the hard tasks and hold nothing back as they plow through. With an outer shell that has been comprised of drum dyed goatskin at the palm and a combination of PWR|Shell fabric combinations, the Hydra gloves support tactile responsiveness and year-round longevity for the kind of motorcyclist who is going to put them through the elements. A Thinsulate polar fleece liner works to retain your body heat while the REV’IT! Hydratex liner will allow your hands to stay nice and dry even in the wettest of circumstances. Additionally, the REV’IT! Women’s Hydra H2O Gloves do exactly the same thing, only with a fitment that is better suited for the ergonomics of a lady’s hand. In doing this, REV’IT! is able to better offer the multitudes of female riders a glove that suits their needs, and their hand shapes, in a way that few others are able to do. The Women’s Hydra Gloves are a great choice for the all-weather female motorcyclist who needs a pair of top-notch hand holsters. Chances are you are not on a journey of 12 feats to prove that you are Zeus’ son. However, chances ARE that you are the kind of person who is down for a good journey. 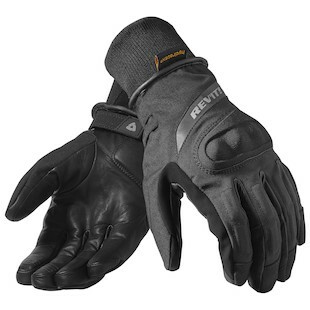 Should that trek take you into wet, cold, and generally unaccomodating motorcycle territory, the REV’IT! Hydra H2O gloves are ready to be there for the ride.